This has been one of the worst weeks I have had working on Kakejiku. Fortunately, the best came at the end of the week. I had a customer send me this scroll to be remounted. There was Yogore, staining on the Ten of the cloth and the Jikubou, was almost completely ripped from the Jikubukuro. We consulted and he asked me what cloth I would select to put into the scroll. I selected the cloud motif because there were no clouds in the painting that would be redundant, and the slate/grey color helped to bring out the skillfully drawn dark and light contrasts in the picture. I also retained the basic Fukuro Hyougu styling. Also, the most interesting thing about this scroll was the Jikusaki, which seemed to have a purple lacquer which I have never seen before. I retained and used the original Hassou and Jikubou, so I had to be very careful to maintain consistent measurements. 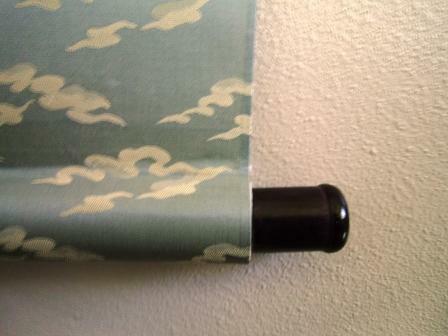 I took extra time in working on the mimiori of this scroll. I hope you enjoy seeing this scroll, because it is going back to the customer's house. This Miniscroll was made with leftover material from larger scrolls. It is about 11.5 inches long and 2.6 inches wide. With a wood dowel at the bottom, but no jikusaki. This simple character for happiness or Joy is written in the Kaisho style, it is in a thress step style. This kakejiku is a sample of the Kana Calligraphy Style. It is framed with a darker gold Karakusa Ichimonji with a Red Kireji. This calligraphy style was developed in and is native to Japan. It is usually written on a special type of paper called Ganpi, which is thin and very complex to frame because it easily tear and rips when wet. Often times the offset of the lines is done to emphasize certain words in the passage or to convey breaks in poetry. 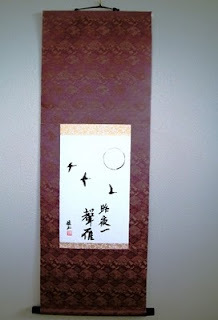 This sample was written by Ryugyoku for a monthly submitted work to her calligraphy society. 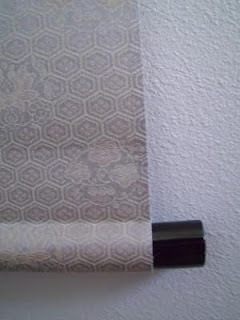 For this scroll I used a smaller jikubou, about 6 bun in size and did not insert jikusaki onto the scroll. The Kakehimo is the Takuboku design. These are the results of various students studying under Yoshimi Maples. I think August was a very good month for the results of the students. In other words Yoshimi’s translation has individualized the scroll to not only be the name of the company or school, but could also become his own bonsai school of philosophy in the future depending on use of the term. The second dilemma was the word studio. There could have been many translations such as 校kou for a more formal school, but I opted to go with the word used by my Sensei for his scroll classroom which is Kyoushitsu and would literally be translated as teaching room, but is the word studio in most online dictionaries. The writing is done in a Gyousho, semi-cursive style. The scroll cloths consist of a light Ichimonji that has flowing gold & silver lines which reminded me of the delicately styled bonsai branches. The brown cloth, although not as dark as the décor of his studio, will hopefully be a good transition color between the lighter color wall and the darker floor. (Only after hanging the scroll in the room will we be sure if this was correct or not.) The cloth does have a lotus flower design, a common Buddhist symbol, and it is capped at the top with a 金茶 Kincha or Dark Gold hanging string and the軸先 Jikusaki (end pieces at the bottom) are a beautiful but simple wood laquer 軸木黒塗り. This wallscroll or kakejiku is no longer available for sale. For pricing or to buy a custom scroll please contact to sales@customjapanesecalligraphy.com or call 801-785-0919. This handmade Kakejiku is done in the Maru Hyougu style written in Kaisho by Ryugyoku. (Yoshimi Yamada Maples) Meaning of the scroll is explained below. he simple meaning is Longevity. The crane symbolizes a 1,000 years and the Turtle 10,000 years. The following is my translation of page 712 of the Zengo Kichigo Jiten. As we age individually as humans we gradually become less self aware. Unfortunately, we will all grow older, and no matter how we try, we cannot prevent this from happening. If this is the way things are, there is a way to age well and continue to maintain a stout heart throughout life. As we look out over our surroundings, we can see many bright, wonderful elderly around us. That method is esteemed, and learning from that example all can learn to age gracefully. The Hakurakuten song has the phrase 「松柏と亀鶴と其の寿は皆の千年」Shouhaku to Kikaku to, Sono Ju wa Minna no Sennen. This means through one year to live long and abundantly like the deep green pines, deciduous trees, turtle and crane. The phrase 「亀鶴の寿」Kikaku no Ju are also the words to celebrate a long life. Furthermore, the long word「亀齢鶴算白頭翁」Kireikakusannhakutouou means to live long like the turtle and the crane by ones head displaying white is a genuine saying for longevity. In any case, living a long life is a reason of celebration in of itself. Year by year all should feel the blessing and enjoy life.